Consumers around the world spend vast numbers of dollars annually on products and regimes that claim to conquer the body's number one enemy--FAT. We are accustomed to regularly bathing our bodies to maintain healthy hygiene. It is equally important to our bodies that we cleanse the inner vessel, as well as the outer. Logic dictates that if we provide the organs of our body with a clean environment, we will undoubtedly reap tremendous benefits. Freeways operate most efficiently when traffic is flowing smoothly. When traffic slows due to overcrowding or traffic obstructions, a traffic jam occurs--backing up cars for sometimes miles. The same is true of the colon. The colon operates most efficiently when bowel transit is flowing smoothly. Constipation occurs when bowel transit times slows, and brings with it numerous health concerns. Sometimes the body's systems need a little help along the way, and Nature's Tea helps this to happen naturally. For thousands of years, the Chinese have known which nutritional elements are needed by the body. Natural laxatives and diuretics are helpful for regulating the bowels and urinary tract. They help cleanse and soothe, rather than irritate. Herbs that help metabolize fat do so in a way that is not harmful to the body. They aid in flushing stored waste from the body's cells. Chemical appetite suppressants, unlike herbal ones, work against the body and alter its biochemical harmony. The biggest advantage of herbal teas is that they allow the consumer to eat normal, well-balanced meals, while "drinking the pounds away." Nature's Tea is a sweet-tasting blend of traditional Chinese and American herbs such as Senna, Marshmallow, Peppermint, English Chamomile, Uva Ursi, Rugose Rose, Stevia, Orange Peel and Japanese Honeysuckle. This combination acts as a mild laxative, digestive aid, cellulite and fat-dissolver, diuretic and appetite-curber. This formula is mild, yet effective. It is a naturally versatile product for anyone interested in optimal nutrition. It is both nutritious and delicious! Nature's Tea is an excellent addition to any weight management or general nutrition program. To meet the exacting standards of Enrich International, no chemicals, preservatives or coloring have been added. No caffeine. NOTICE: This product contains Senna Leaf and Frangula Bark. Read and follow directions carefully. Do not use if you have or develop diarrhea, loose stools, or abdominal pain because Senna Leaf and Frangula Bark may worsen these conditions and be harmful to your health. Consult your physician if you have frequent diarrhea or if you are pregnant, nursing, taking medication, or have a medical condition. 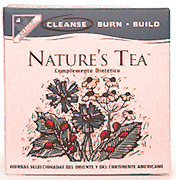 Nature's Tea� is part of the Enrich Cleanse, Burn, Build� Program for weight management success!